Our staff are the most important element to our business; they are the visible shop front to the company: to who we are and how we work. They are expected to be highly professional individuals and are all selected through an interview process. 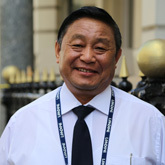 We have a strong pool of staff, many of whom are ex-servicemen, including a high proportion of ex-Gurkha soldiers, whose honesty, integrity, work ethic and discreet nature are well renowned and makes them well suited to such roles. All of our security guards are fully SIA (Security Industry Authority) Licensed and are vetted in accordance with BS7858.